In the first two quarters of FY2013, Apple realized a revenue growth rate of 14.73% to $98.115 billion dollars. In the first two quarters of FY2012, which included an additional shipping week, Apple's revenue rose 66% year-over-year, setting a very challenging growth comparison for the six-month period ended in March. There's no disputing the fact Apple's revenue growth rate has slowed and the company is presently locked in a cycle of lowered rates of revenue growth through at least the June quarter. The consensus revenue estimate for this fiscal year currently stands at $171.44 billion or 9.50% revenue growth. Even more sobering is the conservative revenue growth estimate for FY2014. At this time, the consensus for FY2014 suggests revenue of $188.12 billion and a growth rate of only 9.70%. The consensus revenue growth estimate of 9.50% for this fiscal year is in stark contrast to the 44.58% revenue growth achieved in the fiscal year ended last September. Apple manages its business on a geographic basis. 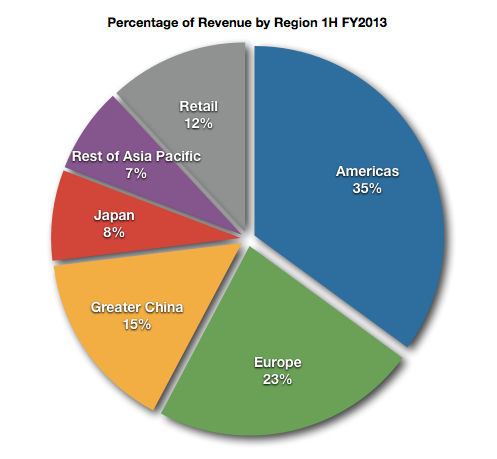 In today's article I will look at Apple's revenue by region for the first six months of this fiscal year. Apple's revenue performance by region provides insight into the reasons for the slow rate of revenue growth and clues to the manner in which Apple can reignite growth over the next several fiscal quarters. The chart below illustrates the percentage of recognized revenue contributed by each of Apple's six regional revenue segments in the first six months of the current fiscal year. In the first six months of the current fiscal year, roughly 58% of Apple's recognized revenue was sourced in the Americas and Europe, exclusive of the retail stores. With the high concentration of Apple retail stores in the Americas and Europe, Apple's revenue growth remains highly dependent on performance in the two geographic regions.